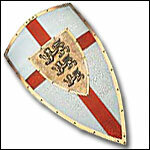 Heraldic, Decorative and Functional Shields. Roman, Viking, heater, medieval, decorative, Spanish, bucklers, kite and round shields! The Buckler was a smaller shield used from the 12th through the 18th century. The buckler achieved a deserved reputation as both a defensive and offensive arm. Our bucklers are Functional and Battle Ready Shields. Decorate your hall or house with our Decorative Historic Shields. Styles and designs will add that certain medieval - historic flare to your décor. Hang our Decorative Shields by themselves or with our Swords or Poleaxes for a grand display. LARP Shields - Hybrid Polyurethane LRP Shields - Shields made from very tough, yet lightweight hybrid polyurethane.